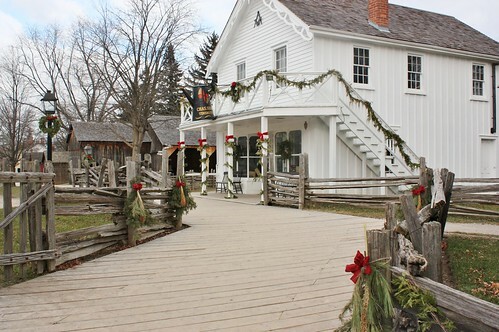 Earlier this month, Garrett and I went to Black Creek Pioneer Village as part of our Advent Activities Calendar. 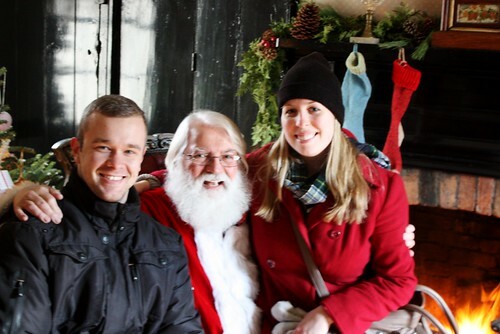 It had been over two years since our last visit and neither of us had experienced it before during the Christmas season. 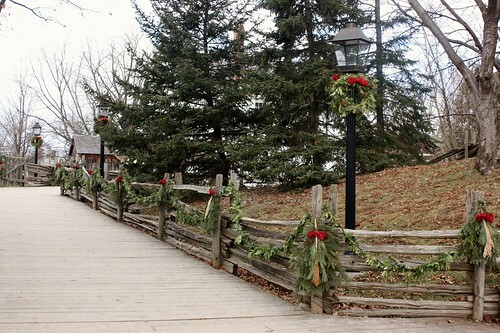 They have a great calendar of events lined up for the holiday season with daily daytime activities and special events like Christmas by Lamplight and Christmas Dinners on evenings on the weekends. 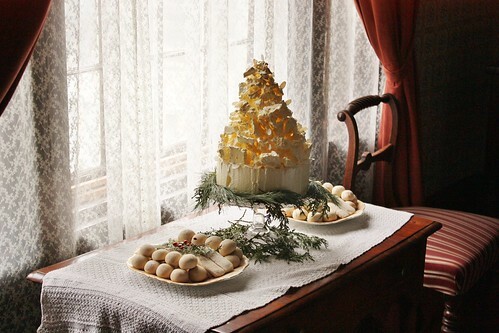 I have to say that I went in expecting it to be a fun and festive outing, but I didn’t realize how nostalgic it would make me for a simpler time when Christmas was truly about being with family, eating great food and celebrating the coming spring. 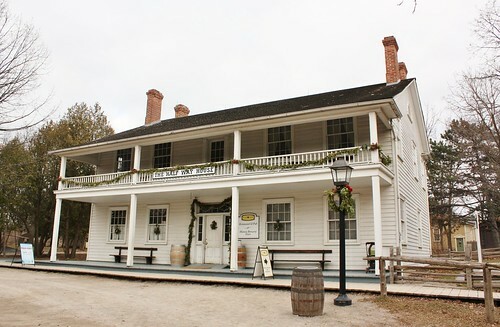 The village showed the Christmas traditions from a variety of nationalities represented in the area, from British and Scottish to German and Dutch. 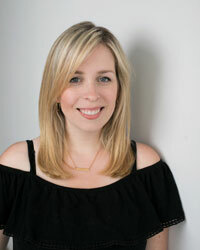 I took many photos and I was very hard pressed to narrow it down even as much as I did, so be warned this is a long post, but well worth it. 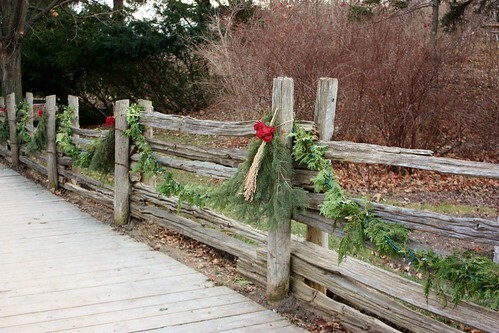 Everywhere you looked there were fresh evergreen garlands, boughs and wreaths. 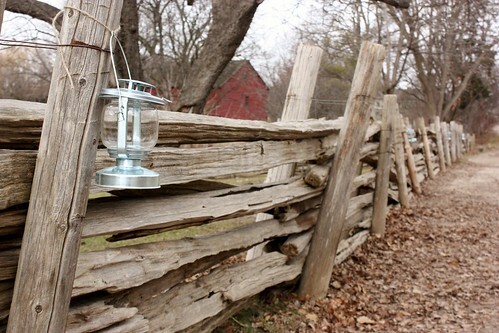 I can just imagine how lovely it is lit up at night with the gas powered streetlights and twinkling lights in the garlands. 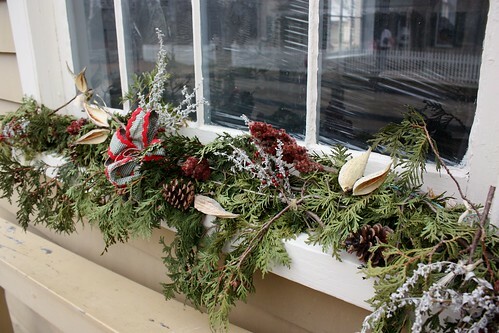 Every storefront and home was decorated with beautiful displays out front – greenery, dried fruit, ribbon, tinsel from the tinsmith. 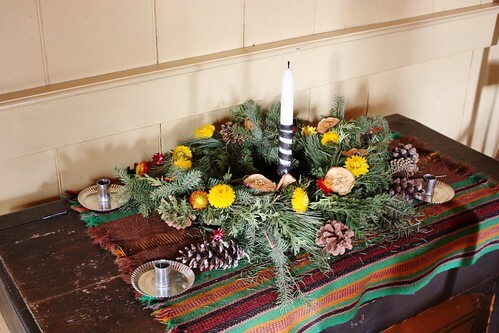 Seeing all this real greenery being used inspired me to keep our faux wreath in storage this year and make a new Grapevine and Greenery Christmas Wreath instead. 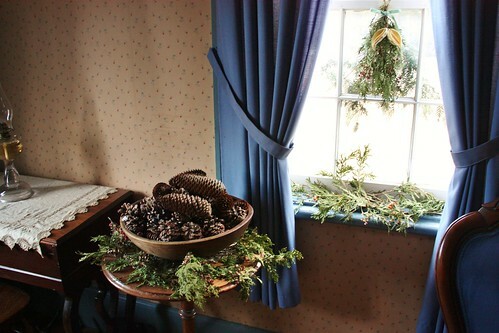 The greenery was even used throughout the interior of the homes, with branches hanging from windows, bowls of pinecones and boughs along windowsills. 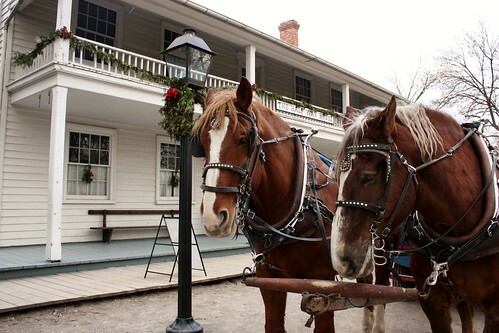 A horse drawn wagon takes visitors around the village to see all the buildings. 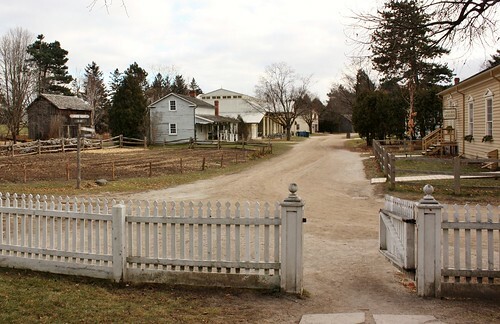 The first building we went into was the Half Way House Inn (from Scarborough, circa 1849). 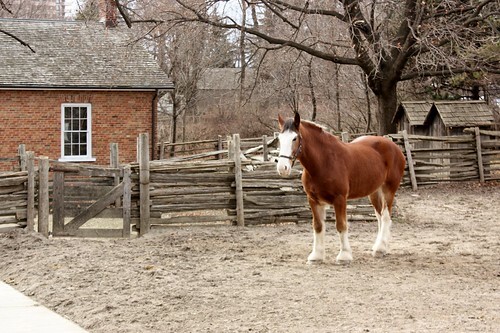 The name comes from its original purpose – as a resting place for stage coach passengers making the trip from Pickering to Toronto. 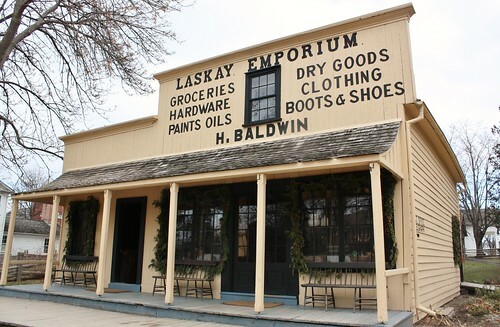 Over the years it has served as a hotel, apartment building and later a store. 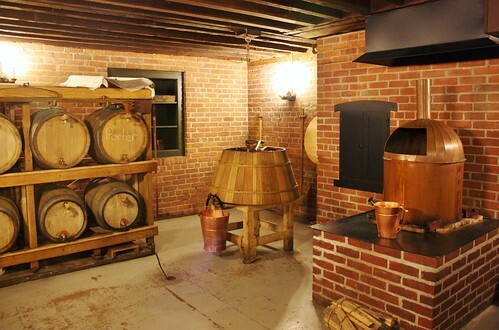 The basement now houses a modern restaurant as well as the Historic Black Creek Brewery. 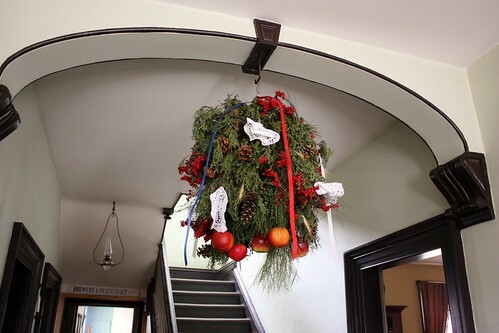 Right inside the front hall, they had a giant kissing ball, a traditional British holiday decoration. 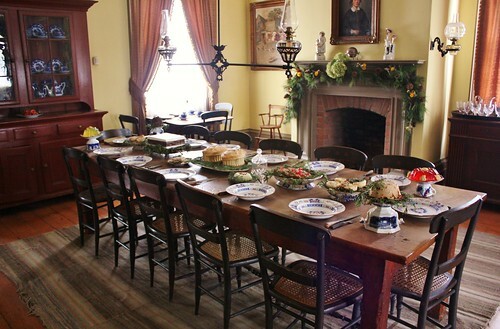 The dining room table was set for a giant holiday feast. 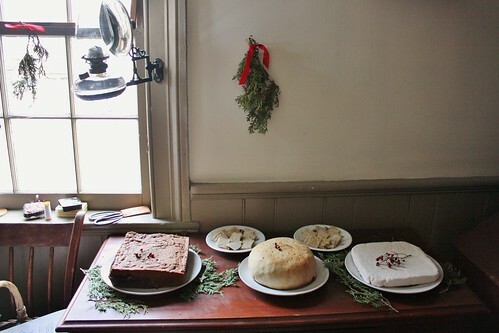 Every building we went to had their own display of traditional holiday treats that would have been enjoyed by Canadian pioneers. 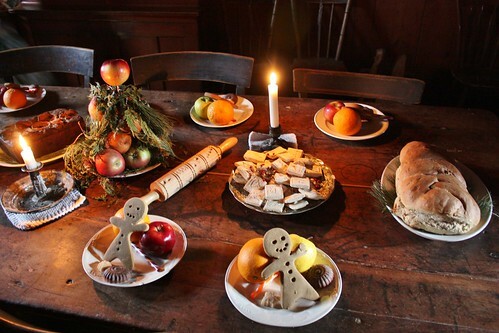 In the kitchen, they were serving up hot apple cider and fresh mincemeat pies. 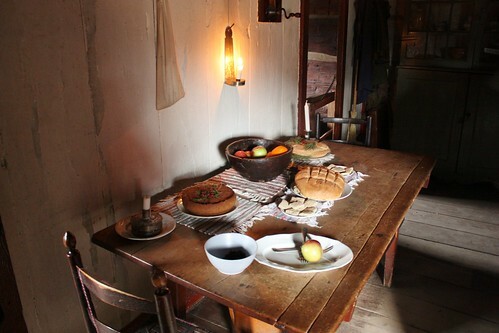 All the food is created in the working kitchens of the village in the traditional way. 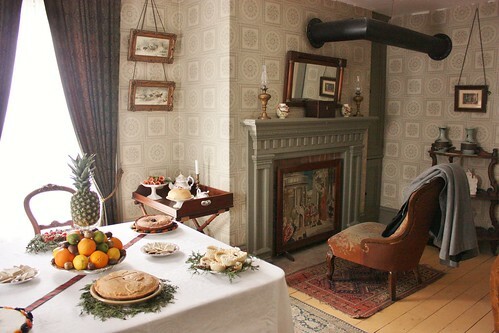 We went to a few of the tours and displays they had that day, and were lucky enough to catch the lighting of a flaming figgy pudding. 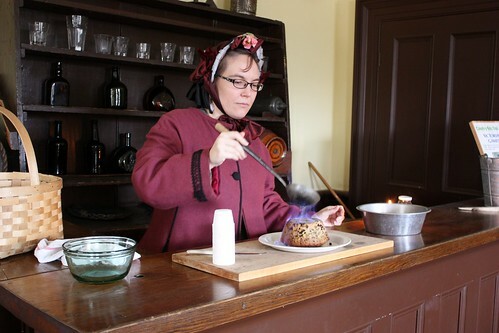 The brilliant flame is created by lighting the alcohol on fire, pouring it over the pudding and allowing it to burn off. Garrett tried a few pieces and said it was quite good. 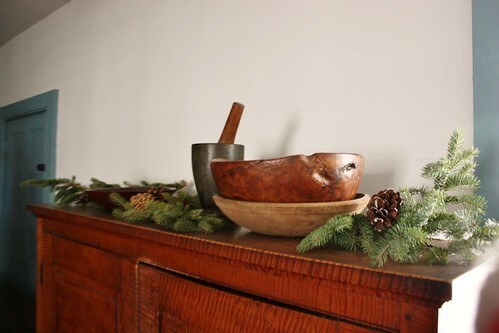 The process of steaming it to cook reminds me of my family’s traditional Christmas dessert – our Family Christmas Carrot Pudding. 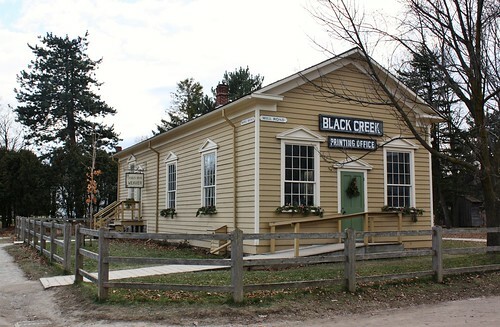 Next, we headed down to the basement to visit the Historic Black Creek Brewery. 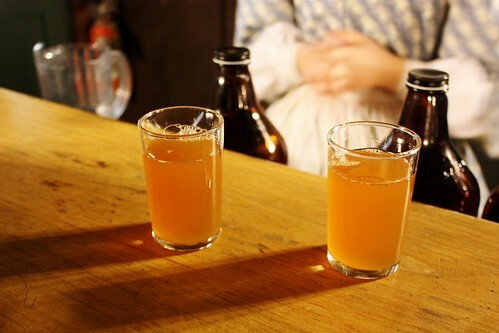 Using local ingredients, they ferment their beers in real wooden barrels. 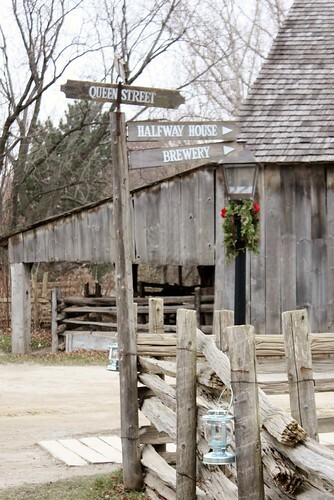 The brewery is a member of the Ontario Craft Brewers. We had a sample of the common beers served in the 1860s – India Pale Ale, Brown Ale, Porter and their seasonal beer the Winter Warmer Stout. You can buy growlers of the beer at the village, or pick up some at the LCBO. 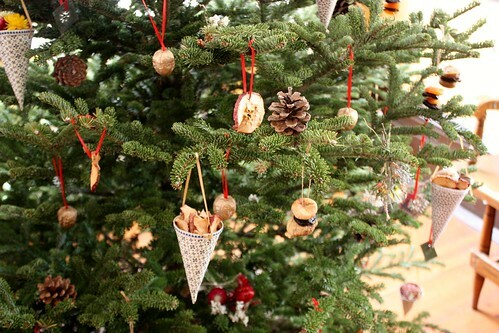 Several of the houses we went to had trees, like this one adorned with dried fruit, dried flowers, nuts and tin ornaments. 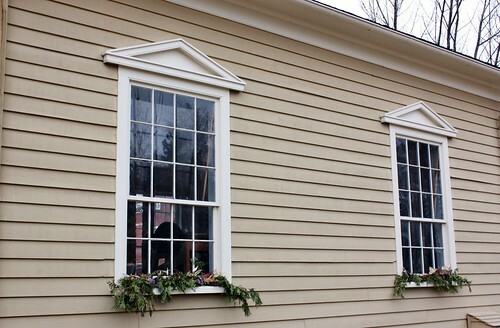 The oldest building in the village is Daniel Stong’s First House (1816) in its original location. 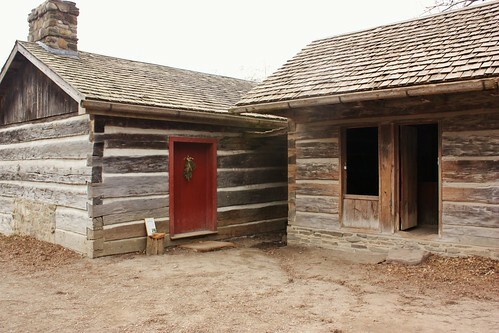 This sturdy, squared log house was comprised of three small rooms, a large stone fireplace and the neighbouring smoke house (circa 1820). 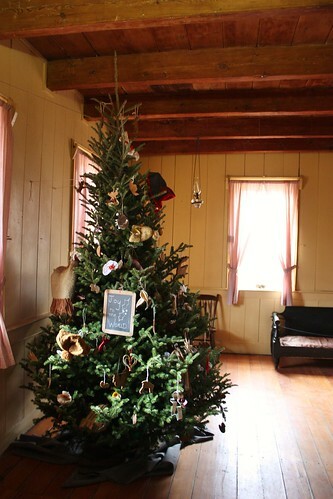 The Stong’s were German, so they would have had a small tabletop Christmas Tree or “Tannenbaum” that would have been brought in on Christmas Eve and “decorated” with the gifts that the children would receive on Christmas morning. 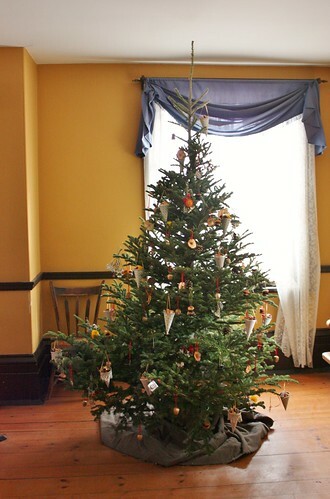 It’s hard to believe that it wasn’t until the mid-1800s that Christmas trees were gaining popularity. 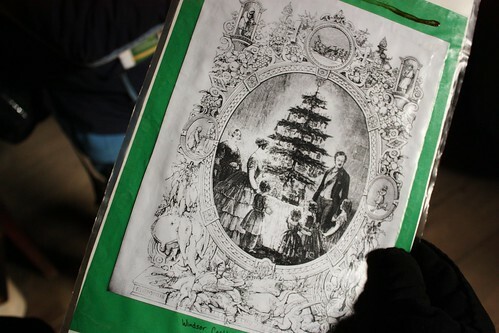 Queen Victoria, who was familiar with the tradition from her German relatives, and her German husband Prince Albert were depicted in the 1840’s (in images like this one) with a tabletop tree, starting the trend in Britain. 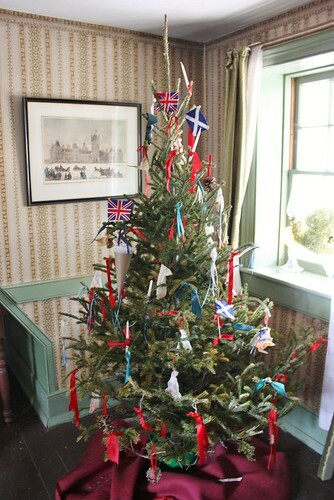 In North America, British settlers would have been exposed to Christmas trees by their fellow German settlers, like the Stongs. Seeing all the gingerbread-like cakes and dishes inspired me to try a traditional German Christmas treat this year – the Pfefferneuse “Peppernut” cookie. 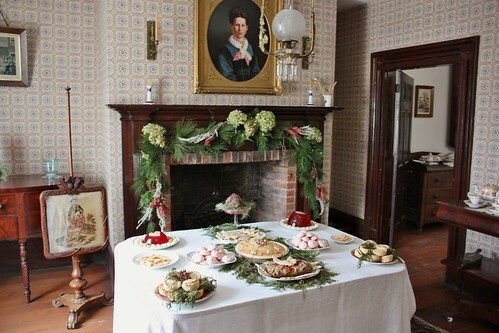 As the Stongs grew wealthier, they were able to build a larger home (circa 1832) and serve a great Christmas feast as well. 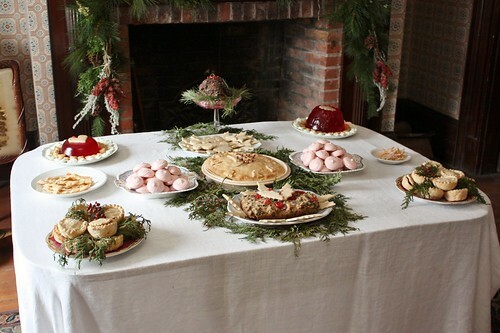 Cakes, cookies, molasses candies, maple syrup treats and fruit would have been set out on Christmas Eve for each child. 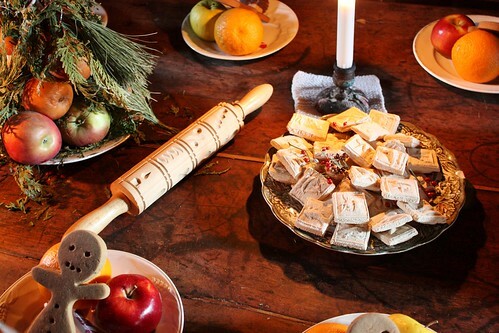 See that rolling pin with the design in it? I’d never seen one before but apparently it is used to make Springerle cookies which originate from Austria and Bavaria. When you roll it over the dough, it leaves an impression, creating a design in the cookie dough. 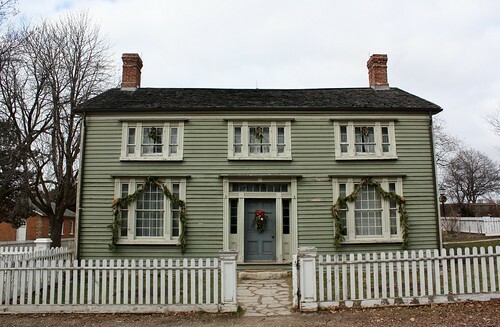 Up the street is the Burwick House (1844), with its rural Georgian architecture, clapboard siding, and lovely garlands. 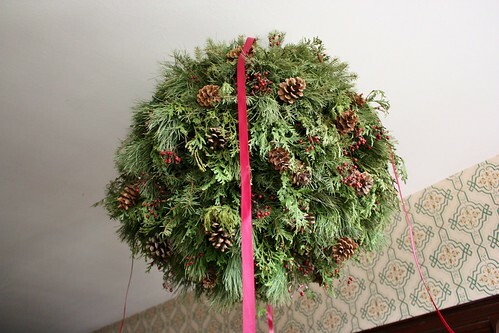 As a British home at the time, they wouldn’t likely have a Christmas tree, but they did have a large kissing ball in the front hall. 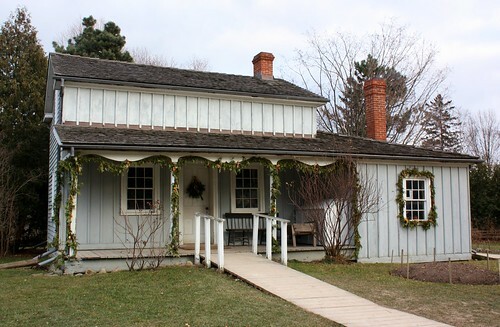 The Doctor’s House (circa 1830) has always been one of my favourite buildings in the village, and it looked even better dressed up for the holidays with garlands and wreaths. 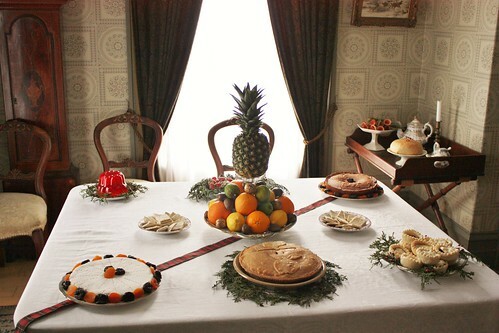 A Scottish family at the time would celebrate with shortbread, cookies, mincemeat tarts, gelatin and lots of fruit. 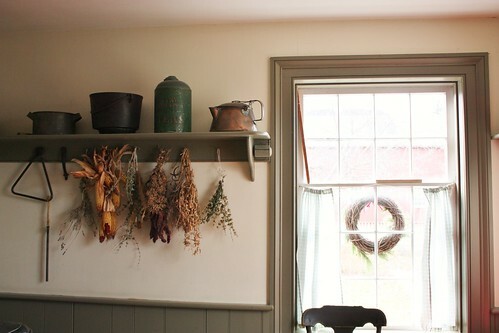 I love the little touches of greenery around the serving dishes. 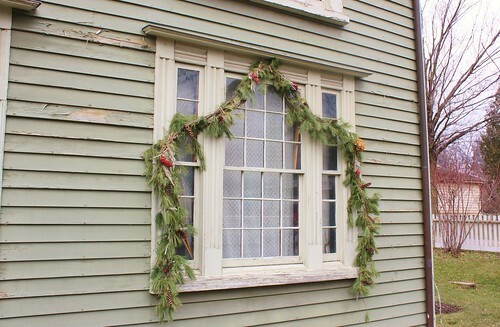 The MacKenzie House (circa 1830) has my favourite decorations – the garland wrapped around the poles, windows and decorative trim looks so festive. 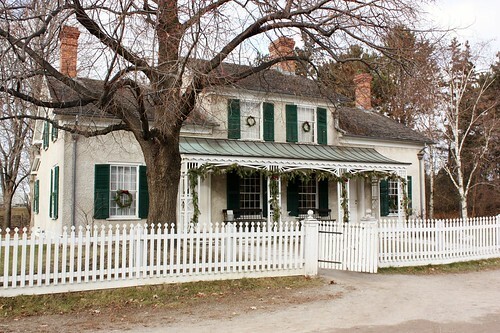 This house has the only tree in the village with real candles on it. They would have lit it for 10 minutes or so a couple of times during the holiday season. 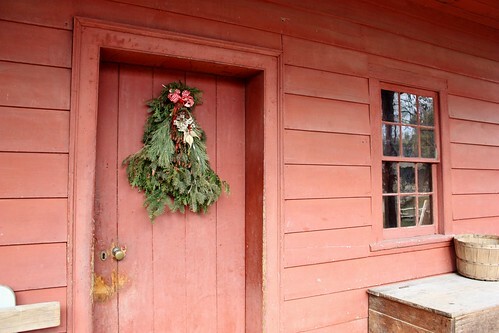 I was disappointed that we didn’t have any snow that day (can you just image how lovely it would look? 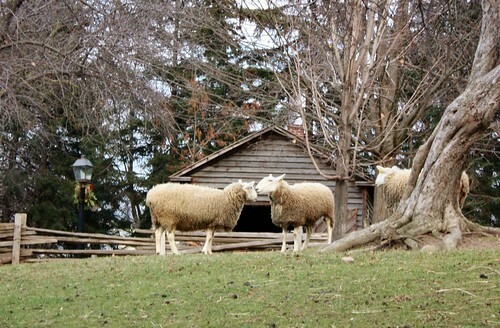 ), but that meant that there were more of the farm animals outside, which is always fun to see. 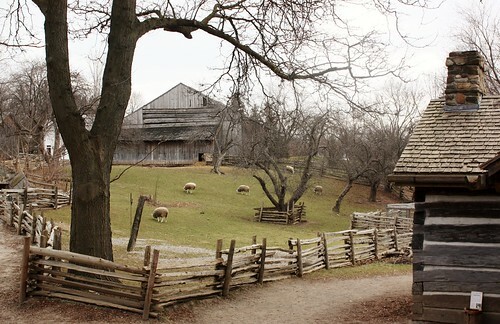 The sheep on the property are shorn each year to make hand dyed wool, but for now they have on their thick winter coats to keep them warm. 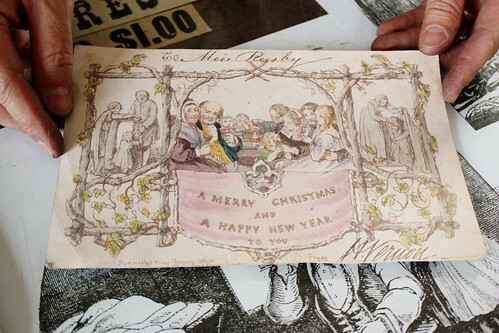 At the Black Creek Printing Office, we got to see a print of the first Christmas card from 1943. 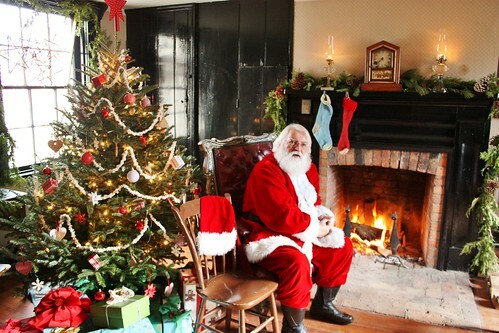 Tucked away in a cozy cottage with a roaring fire was the big man in red himself – Santa. 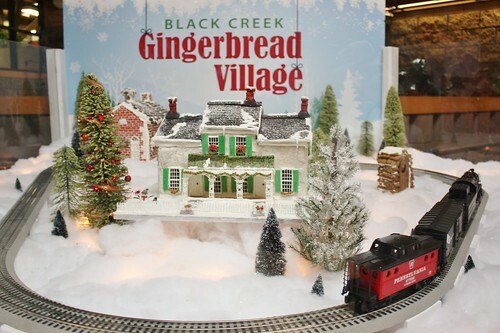 In the visitor’s centre, they showcased the winners of the annual gingerbread contest. 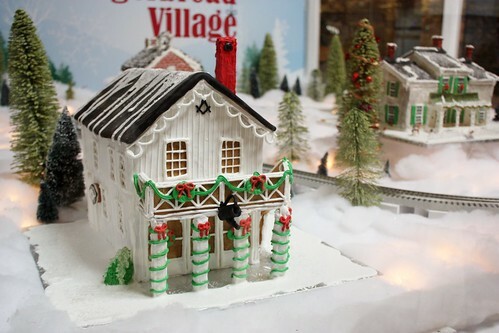 The contestants make beautiful iced and decorated pieces to look like the structures in the village. Aren’t they stunning? 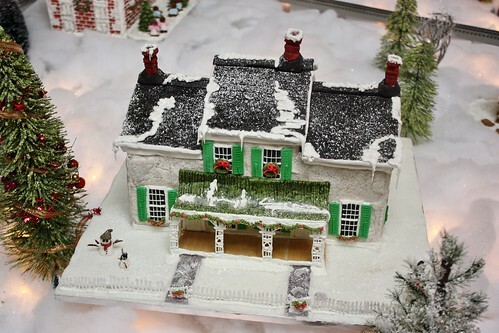 The Doctor’s House – look at the cute snowmen out front! 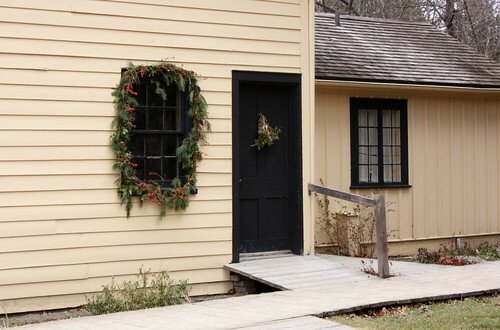 The Tinsmith, complete with the Mason entrance on the side. 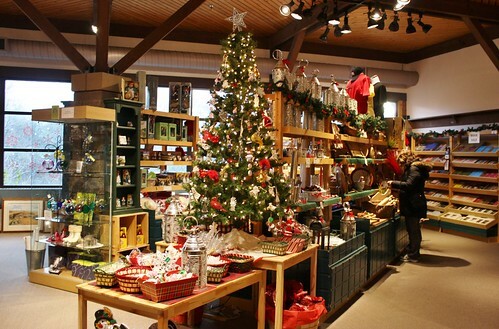 They also have a great store with many gifts that are handmade at the village, including tin ornaments, rugs, leather work, wooden toys and brooms. 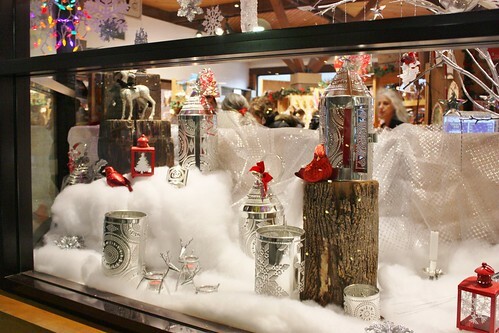 The tin lanterns look so whimsical and perfect for Christmas. 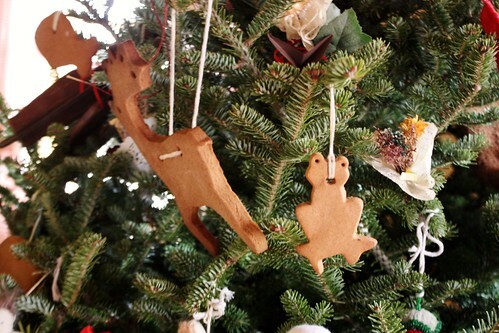 We had a fantastic time and it really did get us all excited about Christmas. 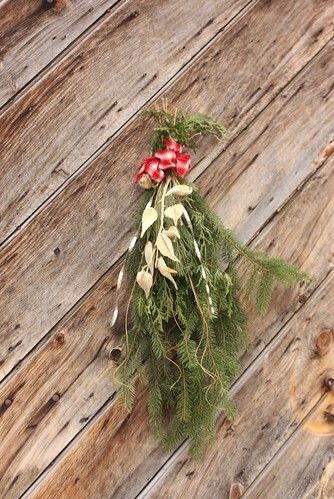 I could hardly wait to get home and put greenery throughout our apartment. 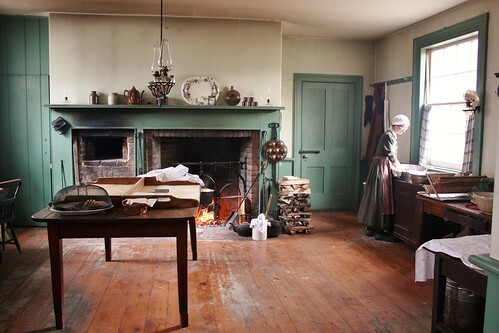 I’m really hoping that we can go again next year and see it all done up for Christmas by Lamplight. 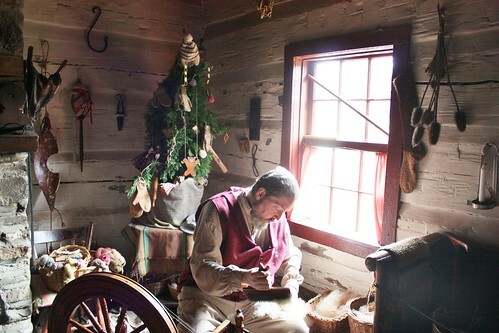 There is still time between now and December 24th to visit Black Creek Pioneer Village and get a taste of Christmas traditions from our early Canadian settlers! 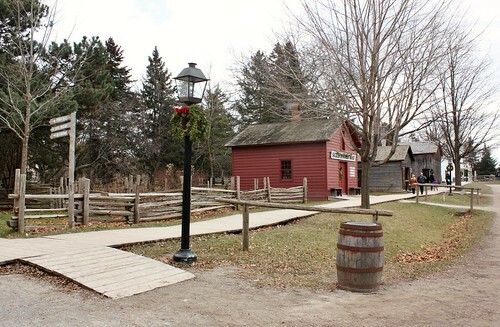 What a cool place to visit- wish it wasn’t so far away, I would love to take my boys to see all of that great history!! We went a few weeks ago in that first snow fall, it was lovely! I really enjoyed all your photos.